IFFCO Tokio General Insurance Company is a joint venture between IFFCO and the Japanese company Tokio Marine Asia Pte. IFFCO and its associates hold 74% equity in this joint venture while the remainder 26% is held by Tokio Marine Asia Pte. IFFCO Tokio Two Wheeler insurance policy strives to give you complete security and protection from unpredicted accidental loss as well. 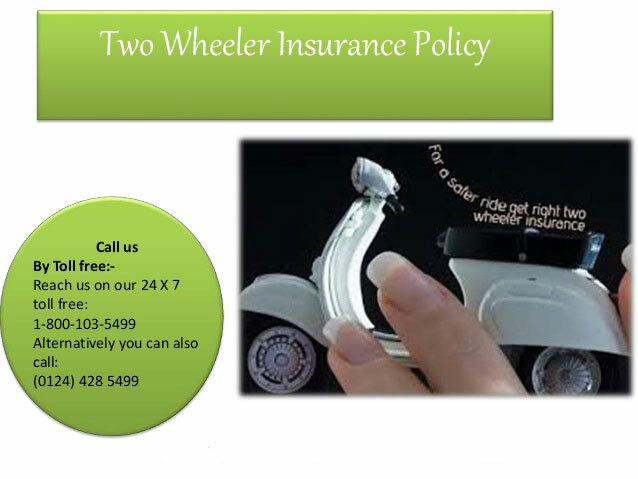 The Two Wheeler insurance policy is must if you want to protect and fulfill your current as well as future liabilities. IFFCO Tokio Two Wheeler insurance give you easy policy renewal options. IFFCO Tokio Two Wheeler insurance offer No Claims Bonus (NCB) of up to 50% on renewal of insurance policy along with 24×7 claim settlement assistance online. The NCB is offered only when the policy is renewed within 90 days from the expiry of the previous policy. Thus, the IFFCO Tokio Online Two Wheeler Insurance Policy is a handy solution to all your needs related to Two Wheeler insurance. IFFCO Tokio Two Wheeler insurance covers every need of your Two Wheeler insurance policy which includes a complete coverage of your vehicle from act of God, physical damage, theft etc. Cashless claim facility at IFFCO-Tokio Cashless Garage Network all across India. If you do not make a claim during the policy period, a No Claim Bonus (NCB) is offered on renewals provided the policy is renewed within 90 days of the expiry date of the previous policy..
NCB discount can go as high as 50%. You can transfer full benefits of No Claim Bonus when you shift your motor insurance policy from another company to IFFCO-Tokio General Insurance. The discount rate remains the same; provided you show evidence that you are entitled to No Claim Bonus from your previous motor insurance. Letter confirming the NCB entitlement from the previous insurer. IFFCO Tokio Two Wheeler insurance provides compulsory personal accident cover of Rs. 1 lakh for individual owner driver of the vehicle insured while traveling in, mounting or dismounting from the vehicle. You can also opt for a personal accident cover for pillion rider. Any damage or loss caused due to any nuclear waste from the combustion of nuclear fuel. any accident, loss or damage or liability directly or indirectly caused by or contributed to by or arising from nuclear weapons material. Then you need to give confirmation whether the Two Wheeler repaired is satisfactory or not. Visit www.iffcotokio.co.in to IFFCO TOKIO Two Wheeler insurance renew online. Through IFFCO TOKIO Two Wheeler Insurance premium Calculator we can calculate the annual premium based on depreciation value and IDV value given. IFFCO TOKIO Two Wheeler Insurance premium Calculator gives you approx amount to be paid during buying new policy and renewing the old policy depending upon the details you have given. 1. What may be the reasons that can make my claim rejected? The policy has expired, or policy has been cancelled or the premium cheque has been dishonoured making the policy invalid. The person driving the vehicle at the time of the accident did not possess a valid driving license or was under the influence of drugs or alcohol. There are also situations where the ownership of the vehicle has changed but the Insurance Company has not been informed within 14 days of such change or the claim was for damages that existed before the policy started. Some other reasons could be that the nature of damages does not co-relate with the cause of accident or that the vehicle was being used for other than personal or social purposes. 2. I own a vehicle which recently met with an accident, but I was not driving it. Can I still make a claim? Insurance policy for that vehicle should exist. If you have paid premium for paid driver or, it would be payable, if the car is being driven with your permission. The person driving the car is duly licensed as the premium is taken based on the seating capacity, which also includes the person on the driver’s seat. 3. Does extra premium have to be paid in case of a claim last year? Ans. There is no extra premium that is payable in case of a claim but if the claim experience is bad then some loading may be charged as per company policy. I have insured my two wheeler TVS super xl during the year 2010 on 3rd october. Now i know my much premium will come as i renew my policy in 2015. Pl.inform immediately to remit amount before due date. sir, I want to know that how much price to be required against insurance of a two wheeler bike (Scooty) just now.